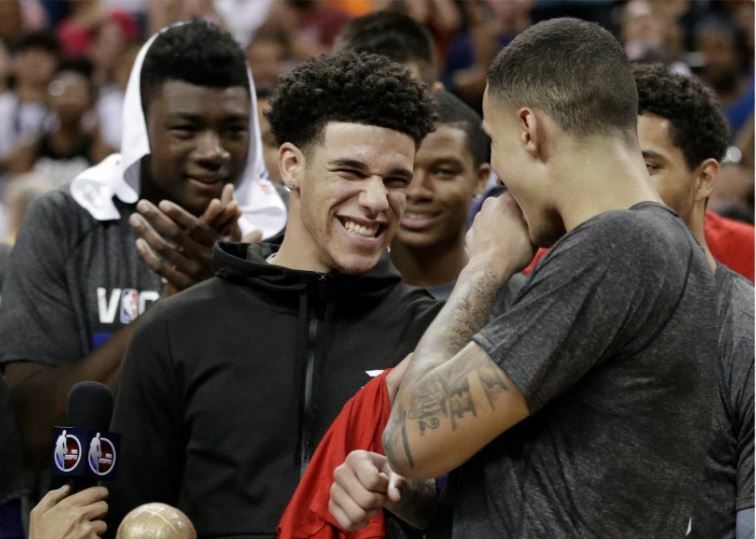 Lonzo Ball didn’t play in the Lakers’ 110-98 NBA Summer League championship win over the Portland Trailblazers, but the former UCLA point guard still claimed league MVP honors Monday in Las Vegas. Ball was held out due to a calf injury Monday, but averaged 16.3 points, 9.3 assists and 7.7 rebounds in his six games. Travis Wear, another former Bruin, also helped the Lakers to their summer league championship. 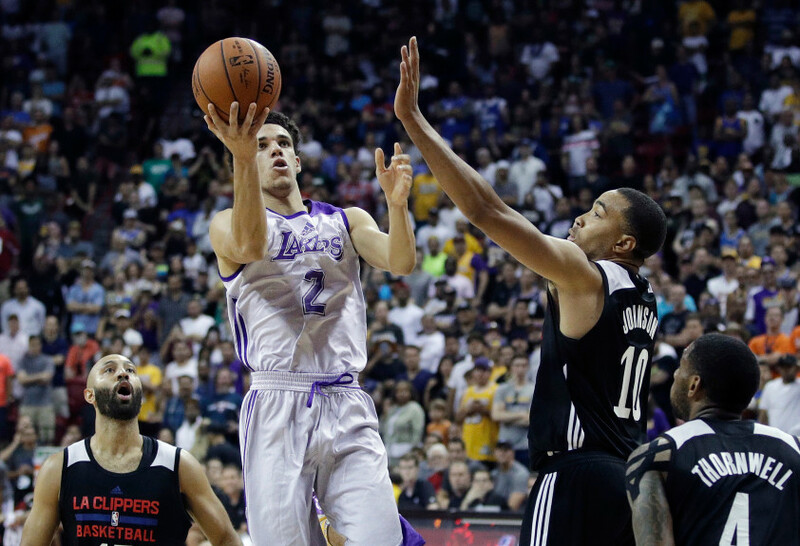 Lonzo Ball‘s much-anticipated NBA Summer League debut for the Lakers started with a bang: an alley-oop pass to Brandon Ingram on the team’s very first possession. The former UCLA Bruin’s night ended with his father LaVar Ball saying Lonzo did “the worst you can do,” after Ball was 2 for 15 shooting in the Lakers’ 96-93 overtime loss to the Clippers in Las Vegas on Friday. Despite struggling with his shot, Ball still made an impact with five assists, four rebounds, two steals and one block. TJ Leaf was one of NBA.com’s 10 standouts from the Orlando Summer League with the Indiana Pacers. He played in three of the Pacers’ five games, averaging 12.7 points and 6.3 rebounds per game. Fellow Pacers draft pick Ike Anigbogu did not participate in any summer league games due to a knee injury, according to the Indianapolis Star. Undrafted guard Isaac Hamilton averaged 5.3 points and one rebound in three summer league games with the Pacers. From the Albuquerque Journal: Bryce Alford, who landed with the Golden State Warriors after going undrafted, will stick to what he knows best: shooting. The Warriors start their summer league schedule Saturday at 7:30 p.m. PT on ESPN against the Philadelphia 76ers in Las Vegas. Jonah Bolden, who attended UCLA for one year before going to Europe to turn pro, played in three game with the 76ers in the Utah Summer League, averaging 10 points and 5.3 rebounds. The Philadelphia Inquirer wrote about Bolden’s defensive versatility after he had a team-high four blocks in his debut. His team will continue summer league play in Las Vegas.